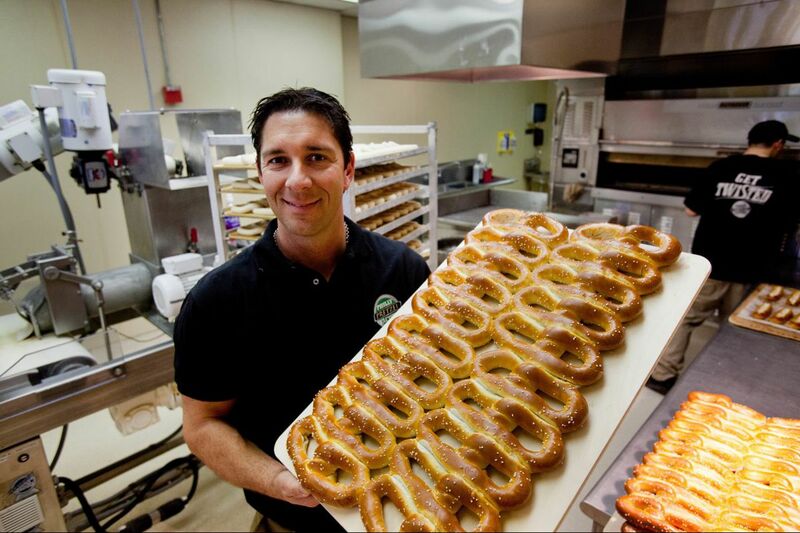 Dan DiZio, CEO and co-founder of the Philly Pretzel Factory, shown with a tray of fresh baked pretzels. He said his firm is opening 25 stores in Manhattan. Home-grown Philly Pretzel Factory is twisting its way to the big time. The company just signed a contract with Gotham Food Co. of New York City to open 25 stores in Manhattan, starting next year. Gotham is the franchisee that bought the development rights from Philly Pretzel for those new stores. Philly Pretzel chief executive officer and co-founder Dan DiZio revealed the company's plans on Monday and said the 25 stores would be "front-loaded," meaning most will open in the first two years of a five-year contract. Five will open in the spring. "This is huge," DiZio said. "We have stores in Long Island and Staten Island. Now, we're able to partner with a well-organized, well-capitalized franchisee to get into Manhattan. For us as a company, it gives credibility to our brand." "We are trying to replace the bagel" in Manhattan, he said. "They eat bagels all the time there. They have pretzels on every street corner, but we have a better widget – a better product. We have to conquer the New York market." Philly Pretzel has 172 stores nationally, with 87 in the eight-county Philadelphia area. The stores range from full-fledged bakeries with a twister machine, oven, and mixer to "drop stores" that are from 100 to 300 square feet, like those at Suburban and 30th Street Stations. They have no oven and are much like pretzel stands. DiZio said 109 franchisees own the 172 stores, with many owning multiple locations. He began the program in 2005 when the business got too big; Franchisees pay a weekly fee to Philly Pretzel for use of the brand's name, equipment and products as well as training and marketing, or 6 percent of weekly sales. The largest Philly Pretzel franchisee in the Philly market is Ron Heil, who owns 21 stores with partner Gary Nolan. Philly Pretzel is currently interviewing franchisees for the Manhattan stores. While the privately held company does not release annual revenue figures, DiZio said total sales are up 7 percent from 2016 to 2017, while the company is in its 10th year of same-store sales growth among locations open more than a year. DiZio said he expects to top 150 million pretzels sold this year, beating last year's sales. Retail real estate experts say the New York market is a tough one to crack. David Green, who co-leads Colliers International's New York retail group, said most fast casual tenants like Philly Pretzel are under direct ownership in the city and are not franchises. And Philly Pretzel's typical lease term is five years, which is less than the traditional lease in Manhattan of 10 years or more. DiZio said Philly Pretzel's competitors includes "anybody in the food industry who sells snacks or convenient food on the go." Chief rivals, both locally and nationally, are Auntie Anne's, Wawa, and Dunkin' Donuts. "But we are so niched," he said. "We bake and serve fresh, hot out of the oven every day with the convenience of someone being able to pull in and get out with our fresh product right there – that's our distinguisher." Philly Pretzel opened its first store on May 2, 1998, in the Northeast under DiZio and partner Len Lehman at Bleigh and Frankford Avenues. When the line didn't stop at closing time, "I knew we had something special," DiZio said. This April, Philly Pretzel moved its headquarters to the former Rita's Water Ice building at 1525 Ford Rd., Bensalem. Bensalem High School, where DiZio cut classes to sell pretzels, sits just 150 feet away. "I've come full circle," he said. "They say 100 units is a big number – it marks a true franchise company. But to get into a big city like Manhattan is a game-changer."